What a great pleasure is it to listen to such amazing works from bands you’d never expect! “The Great Maddening” is an album that was prepared for many years now by the band Vindsval. Vindsval are from Luxemburg and they are active since 1997, even though they existed since 1996, but with another name (Dregath). In 1999 they released their symphonic black metal debut “Imperium Grotesque” with the label “Skaldic Art Productions”. They were to release their second album in the same label, but the label quit… So they kept the songs and the artwork and released it a couple of years later under a new name and a new label. 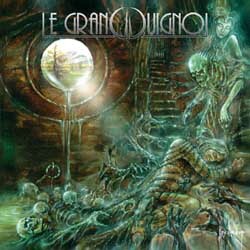 Le Grand Guignol’s music has evolved a lot since 1999. Most of their musicians are session members of Falkenbach and participating in their studio albums! Except for the obvious improvement in the technical skills, the sound and the orchestrations are much enriched. Symphonic black metal mixed with avant-garde piano and violins, generating an orgiastic atmosphere: something like a carnival’s military marching, a blood-bathed puppet show, or a circus waltz… It’s very difficult to describe the weird feelings their music generates. There were some “hints” in their previous works, but this time the result is simply brilliant. Insane piano interludes and bizarre violins followed by unusual choirs in the background, build the setting for the great maddening, a title that fits their music perfectly. Their melodic black metal isn’t very raw and actually the term extreme metal with black vocals describes their music with more accuracy. What make this album so unique are its wonderful orchestrations. Classical piano interludes and violins are used in an unusual innovative way creating a strange atmosphere of grotesque aristocratic grandeur, a post-war theatrical nostalgia. Thankfully the new label “Maddening Media” finally releases this CD, with another great work by Kris Verwimp in the artwork. The only thing that keeps me for giving them 10, is that even if the first 5 songs deserve it, the rest are at a slightly lower level. I really hope it won’t take them that much time for their next album. If you want to listen to them visit their official pages below.